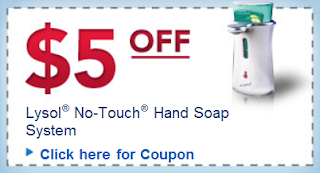 Have you been wanting to buy a LYSOL® Healthy Touch® No-Touch™ Hand Soap System? Lysol is offering a $5.00 off coupon to help! I have seen them as cheap as $6.95, so if you shop the sales you might get one for pennies!